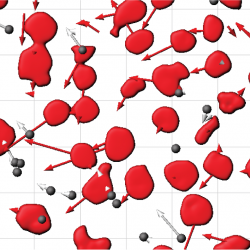 How do biological materials balance activity and dissipation? Using a reconstituted actin cortex, we successfully applied the framework of stochastic thermodynamics to understand the interplay between internally driven myosin II derived stresses, and the dissipation of work by actin networks. The actin cortex, the mechanical machinery within the cell, is a disordered random polymer network attached to the inside of the cell membrane. Myosin II is a molecular motor which grips the network and contracts it, generating mechanical forces. How the motors contract the network, and how attachment to a fluid membrane modulates this contractility is unknown, as we do not have precise control over these components in cells, and cannot visualize them with high fidelity. To address this problem, we ‘mimic’ the actin cortex outside of the cell by coupling isolated F-actin (right, red), myosin II (right, green) and its attachment to the membrane (not seen). We induce contraction (far right) and study the behavior of individual F-actin to explain the mechanism behind cell contractility. One of the ways cells change their shape is when they attach to an adhesive surface, like the extracellular matrix (ECM). Cells ‘spread’ over the ECM, creating a large, flat interface. Dynamically, the early stages of cell spreading are very similar across many cell types. It is presumed that the actin cortex, the structural machinery in the cell, is responsible for governing the dynamics of this shape change, although in real cells, there are too many components to to quantiatively dissect what its specific role is. 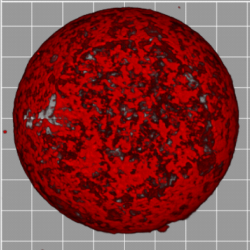 So we create simplified, artificial versions of the cell, with only model membranes and purified actin. In this work, I probed the contribution of the synthetic cortex to the mechanical properties of the membrane through comparing the dynamics of adhesion and spreading of vesicles that carry this actin cortex to vesicles that do not. 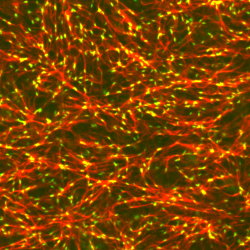 We find that the actin (red, right) contributes an enhanced viscosity to the membrane, and this viscosity dampens the dynamics of cell spreading(far right). (right) F-actin network within a liposome. How do cells generate and transmit forces collectively?